The film introduces us to a 9 year old Suzu Urano who lives in a small coastal town called Eba, near Hiroshima in 1933. Though her family is rather poor, she seems to lead a happy life. Her favourite pastime is drawing and painting. One day she comes across her friend, Tetsu Mizuhara, whom she finds sitting on the shoreline. Tetsu’s older brother recently died in a ferry accident. He doesn’t want to go home as his parents have taken up drinking and no longer go to work. Suzu decides to paint a picture for him based on upon his description of the white peaks on the waves looking like white rabbits. He takes the picture and thanks him and tells her that he plans to join the navy. As the years progress Suzu works for her grandmother’s business of cultivating seaweed to be used as Nori sheets. In 1944 at the age of 19, her parents receive a visit from the family of a young man her age asking for Suzu's hand in marriage. The young man took an interest in her when he saw her during one of the family visits to the area when he was a child. Apparently the pair played together as children, though Suzu cannot remember. Suzu is anxious about the meeting even though her family tells her she can say no, and goes to the sea shore instead of meeting them. She accidentally meets them anyway as they ask her for directions back to the station, though they don’t realise it’s her. 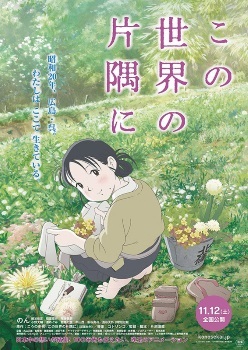 Initially thinking the man asking for her hand in marriage is Tetsu, Suzu is disappointed to find out the truth, however still decides to marry the man, Shusaku Hojo, and move to the family’s home on a hillside above Kure, more than 25km away from her home in Eba. With the war well under way, and Kure being a port for the military, most of population is employed with the military. Shusaku is judicial civilian officer at the military court. Suzu finds herself doing most of the housework for the family as Shusaku’s mother, San Hojo, is injured and spends most of her time in bed. Suzu’s sister in law, Keiko Kuromura, who has returned home after the death of her husband and forced closure of her business, constantly criticises and nit-picks her. But although Suzu is a little bit clumsy and forgetful, she still manages to be loved by the family. As the war progresses, Suzu is forced to help out with handing out rations to citizens and even finds herself being rather creative in providing meals for the family using locally found herbs and recipes from eras ago, and creating new clothes from her old kimonos. Despite the hardships her family life is still filled with joy and happiness, especially with Keiko’s children around. Suzu’s love of drawing gets her into trouble as the military police discover her drawing the harbour side including the various war ships stationed there. She is accused of being a spy but luckily she is let off. Later her childhood friend Tetsu arrives as his ship has docked for shore leave in Kure. Shusaku lets them be together during the night knowing that this might be the last time Tetsu sees Suzu. In the end despite Tetsu telling her he still has feelings for her; Suzu tells him she is faithfully married to her husband. Later Shusaku is drafted by the Navy to a base at Otake city, some 60km away. 1945 brings regular US air raids not only during night, but increasingly during the day as well. By mid-summer US aircraft commence firebombing of Kure with the Hojo family house also almost burnt to the ground. However thanks to Suzu’s actions, the house is spared any major damage. But soon after yet another US bombing run of the harbour, a major tragedy strikes Suzu and the rest of the household. This film is based upon Fumiyo Kono’s seinen manga which was published in Weekly Manga Action back in 2007 to 2009. Considering how the covers of that manga anthology mostly feature bikini clad girls or idols, I found that fact pretty hard to wrap my head around. The manga just seems unsuited to that publication. The manga was published in English as “To All the Corners of the World” back in 2011. Prior to this adaptation, the manga did receive a live action TV adaption also in 2011 which I have not seen. This anime adaptation was directed by Sunao Katabuchi whom I have previously talked (or more accurately raved) about. He directed the much underappreciated “Mai Mai Miracle” and the mostly unseen in the west “Princess Arete”, which will finally get a bare bones home video release from All the Anime in the UK in December. However Katabuchi is known to most western anime fans as the director of “Black Lagoon”, which seems really out of place when you compare his rather family orientated theatrical fare. I really think this is Katabuchi’s best work to date. The film charts the adolescence to adulthood journey of a young woman living the Hiroshima area during World War II. Of course the audience already knows what the outcome of the film is as such due to the setting and time period. But the film really isn’t about the atomic bombing of Hiroshima. It’s about Suzu’s life and family. More broadly it’s about family and working to survive when outside forces threaten to tear your family apart. In no way is war glorified. Naturally war is portrayed as some thing destructive to society and the individual, shown in the way Suzu’s hobby of art is curtailed by the military. Like other Japanese films about the war, Japan to a degree is portrayed as victim, or more accurately its citizens are. Personally I have no problem with that. It’s undeniable that Japan did some bloody awful things, however the citizens where divorced from that aspect of the war, especially on the home front where this story takes place. It's easy to argue they are victims of their warmongering leaders. While the second half of the film takes a much darker turn, there are more than enough touches of humour to offset the grim sections of the film. There are some really cute moments in the film where Suzu's mother coyly discusses what will happen on the wedding night, likening consent to the groom asking if his wife will let him open her “umbrella”. Hilarity later ensues as Shusaku literally asks for her umbrella. Even a very serious moment such as Suzu being accused as a spy by the military police is later laughed away by her family who can’t believe anyone would be stupid enough to think she was. There are some really nice ideas explored in the film such as Suzu getting lost in Kure and ending up in the red light district. There she meets a young woman whom she previously met back in her grandmother’s house in Eba as child. Back then Suzu was told by her older brother that the child she saw was a zashiki-warashi (a child spirit), when in fact she was a homeless child living the grandparent’s ceiling, hiding from them and only to come out and steal a bit of food when hungry. There are couple of these moments in the film where a backstory of a seemingly inconsequential character is told. I felt it really added a lot to the film. If anything I probably think the film is a little bit too long. I thought the film would come to a conclusion once the bomb was dropped on Hiroshima, but it kept going, telling the story of the aftermath and what happened to Suzu’s family. Surprisingly not a great deal of the bombing is really shown nor the full impact of its aftermath, with the exception of one young girl and her mother, who become vital to post climax part of the film. And despite the horror that threatens to break the family apart in the second half of the film, it doesn’t really wallow in sentimentality or becomes schmaltzy, which easily could have been the path it took. The animation, produced by MAPPA (of “Yuri!!! on Ice” and “Terror in Resonance” fame) is excellent. It captures the feel of the original manga and depicts World War II Hiroshima Prefecture with incredible detail and accuracy. From what I understand Katabuchi went to great lengths to make the film as accurate as possible. The film certainly moved the audience, they loved a lot of the light touches and humour in the film. The Japanese woman in her thirties who sat next to me was very emotional in the second half and cried a bit. From the opening production idents, I discovered the film is being distributed in Australia by Umbrella Entertainment. As far as I’m aware they don’t do theatrical releases which is a crying shame. This film should have had a limited theatrical release in this country, mostly as an antidote the many poor “Your Name” clones and faux Ghibli films Madman has and will foist upon cinema goers. Instead it will wallow in relative obscurity here (it's still not solicited for home video release in Australia). Overall I really liked this film. Perhaps it is a bit too long. Maybe some of the material chronicling Suzu’s early life should have been shortened or cut all together. However I did like some of the explorations of secondary characters which some might see as the director being indulgent. Regardless I really enjoyed this film. 8 out of 10.